The key to making money in this industry is to have prizes that the public wants and have high perceived values. Choosing the right prizes (and displaying them properly) takes guidance from people who spend full time in this sector and enjoy staying on top of the latest trends. The other key is to purchase these top prizes at fair prices. 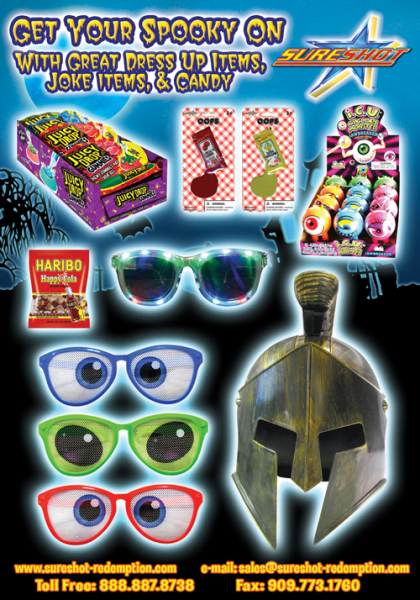 Aside from selling redemption toys, RI Novelty is in the forefront for offering marketing and merchandising ideas to clients as well as non-clients. This month, we are sharing with you six prizes (or prize categories) that have proven to be extremely successful for our customers. These products were chosen based on the number of times ordered and total units sold over a four-month period. If you are not carrying these items (or like products), consider stocking these type of prizes to observe whether the products’ appeal increases play. 1. 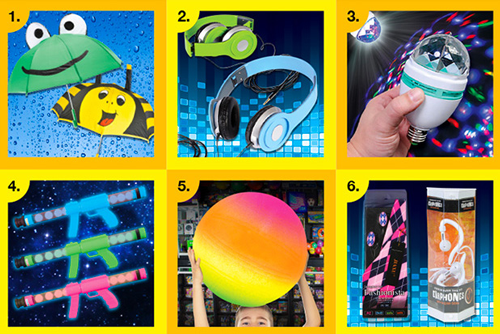 Umbrellas: Kids are loving these unique prizes. Moms like them as well for their usefulness for school age kids. They are colorful, large and attractive in a display. 2. Headphones: Our neon headphones quickly became bestsellers. Eye catching color, good quality, appealing packaging and an excellent price. 3. Disco Bulb ELDISBU: Turns any room into a party atmosphere. Display in counter only, showing both the box and the item so customers can see that it fits a standard bulb fixture. 4. Moon Blasters: A long time super item, now in 3 colors. 5. Rainbow Balls SBRAI18: Colorful, big & bright. The most eye catching ball in your display. Alternate with 18” knobby balls on your back wall for a winning combination. 6. Earbuds: We all use them and we all lose them. Great packaging and perceived value, excellent price. A counter item with the same upside as larger headphones. These products have done very well this year for all of our customers. If you’d like to see our most recent list of 100 bestselling items broken down by ticket value, click here. Please call me if you would like to discuss how to make your prize selection compelling, wantable and winnable! Visit their website at www.rinovelty.com for more information, or call them at 800-528.5599. HMS Monaco has a full line-up of merchandise coming for the new Star Wars movie, The Force Awakens, Episode 7, that will be opening on 12/18/15. They believe that this will be the big hit for the fourth quarter that everyone will be looking for. Their line will include Star Wars plush and novelties for the upcoming movie. Sureshot is moving into Fall with items that fit into the Halloween theme, but without being “Halloween” only so they’ll work all throughout the season and beyond as well. And Sureshot is continuing to promote their In-House imprinting with very low minimums on items right from their stock of popular redemption and gift items. This means turnaround time is minimal and prices are reasonable so call or email for more information today. For more information, call 888.887.8738 or visit www.sureshot-redemption.com. 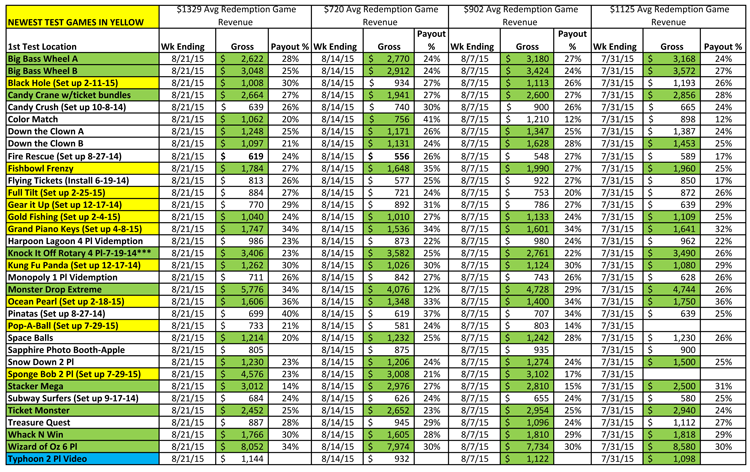 TRR has compiled the Top 60 Redemption & Top 12 Merchandise Dispensing Games that Alpha-Omega Amusements & Sales currently has at one of its locations. Included in the ranking is an Apple Photo Booth and an Air Hockey game. There were 83 games in operation at this particular location at the time of this report. SpongeBob Pineapple Arcade, Fishbowl Frenzy, Whack n Win, Grand Piano Keys, Ocean Pearl, Kung Fu Panda, Gold Fishing, Black Hole, Full Tilt, Gear It Up, Pop-A-Ball, and Candy Crush. Shown in 2nd Test Location are Fishbowl Frenzy, Gold Fishing, and Hungry Chickens. Shown in 3rd Test Location are Black Hole, Jurassic Park (Video), Full Tilt, Graveyard Smash, Hop Star, Yahtzee, and Three Stooges. The July-Aug. 2015 the data shows SpongeBob as the only new game ranking in the combined Top 10 (#3 overall, #3 in redemption). Five new games are grouped closely together in the ranking from #13 to #18: Fishbowl Frenzy, Whack N Win, Grand Piano Keys, Ocean Pearl, and Kung Fu Panda. All 5 games have had consistently high earnings over the past several months but SpongeBob stole the show (See Breaking News for complete coverage on SpongeBob). Mega Triple Crane grabbed the #1 ranking for Merchandise Dispensing mainly because one of its three bays was converted to tickets. 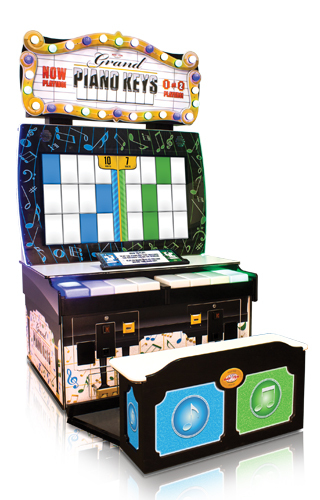 This had a slight effect on the revenues of both the Knock It Off Rotary (Tickets) and the Candy Crane with Tickets, however both of these games still ranked in the Top 8 overall and remain in the Top 4 Merchandiser category. The 2nd an 3rd Test Location shows that when a Top 20 game is added to a location that does not have so many of the other new games, these games can rank at the very top for a few months and are very good investments. Test Location #1 is important because it shows the ‘workhorse’ games that are the backbone of a games operations. It also shows which games get cannibalized when a new game is added. This is critical information to have when making future game buying and selling/trade in decisions. There are many great games in the Top 60 to choose from. Top 30-60 are all candidates to buy reconditioned at reduced prices. Many are great long term additions. UPDATE: TRR just received the first week’s revenue from Crossy Road that was set up on 8-25-15. Crossy Road grossed $1,480 at 37%, slightly outearning Fishbowl Frenzy’s $1,428. SpongeBob grossed $2,582. TRR will provide full comparisons in the next issue.